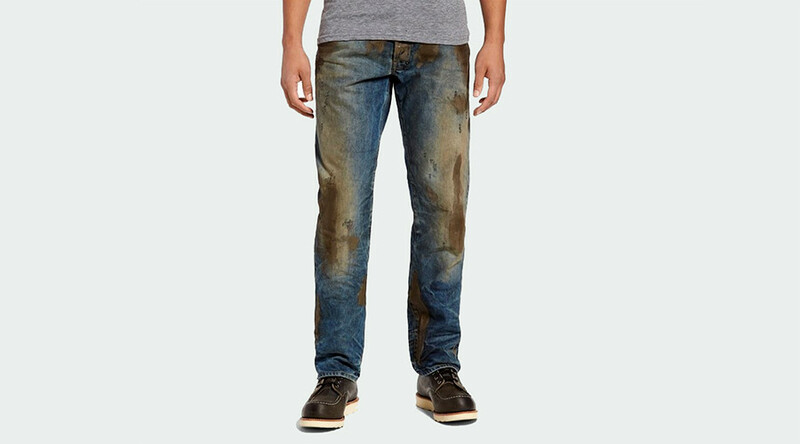 Nordstrom is selling $425 jeans with fake mud stains for shoppers who wish to embody “rugged, Americana” workwear. “Rugged, Americana workwear that's seen some hard-working action with a crackled, caked-on muddy coating that shows you're not afraid to get down and dirty”. As if all that wasn’t ridiculous enough, the company are actually charging the extortionate price of $425 to wear the fake-stained pants. When is nordstrom gonna release $500k pants that look pre-pissed?? The mud look has BEEN over, bro. It’s worth noting that last month Nordstrom were ridiculed for selling clear-knee ’mom jeans’ for $95 and before that, a sold-out literal rock in a pouch for $85. Either the joke’s on us or Nordstrom have gone off the deep end. The perpetrators behind the offensive ‘mom jeans’ – aka. Topshop – have also just launched an escalated version of the former, in an equally ridiculous $100 ‘clear plastic straight leg jean’, which really shouldn’t be considered as jeans, nor actual clothing.